There aren’t any food-related Days to celebrate today, although today *is* Tell a Fairy Tale day, so maybe gather around with your nearest and dearest and read them something from the Grimm brothers. Meanwhile, I still have a can of clams to use up, so today we’re doing what I intended to do yesterday, which is to tackle Clam Chowder Day. 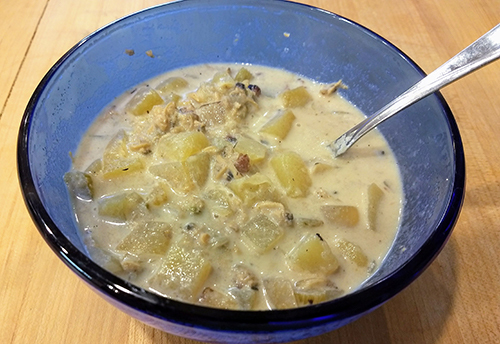 Apparently there are different versions of clam chowder out there – red and white – but the only kind I’ve ever had is the white kind, so that’s what I made. I used this recipe, because it seemed pretty straightforward. It’s pretty simple to throw together. You cook bacon, onion, and celery in a little bit of butter until the vegetables are soft, and then you stir in all the rest of the ingredients and simmer until the potatoes are tender. Because it’s Monday, which means I have rehearsal in the evening, I actually put this together this morning, and then reheated it for dinner. I think that was a wise, move, as the potatoes helped to thicken up the soup as it sat. Also I added a dash of half and half, because I felt like it needed a bit of extra ‘oomph’. We ate them with some faintly-tuna-flavored ‘crackers‘ sprinkled on top (because the cats seriously aren’t interested, so we might as well use them up somehow. Eh, they’re not oyster crackers, but they worked the same, so it was fine. Were the cats any more interested in the soup than the crackers? Azzie is always interested in whatever we have, but the rest of them didn’t much care. However, they’d just been fed their own dinner, so that could be part of it.